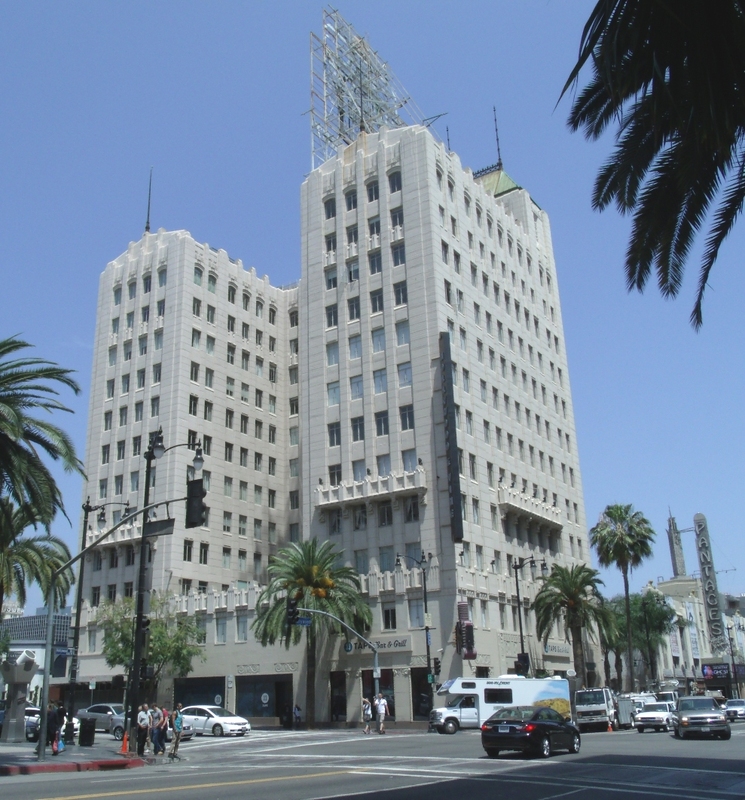 The 12-story Bank of Hollywood Building opened in May 1929, at the northeast corner of Hollywood Boulevard and Vine Street, on the site of the bank's original one-story home. The building -- designed by architect Aleck Curlett, with a Neo-Gothic façade and Art Deco interior, and topped by what was touted as the world's largest roof sign -- quickly became a center of business and finance in the city, particularly for the growing entertainment industry. The first tenant in the new building was producer and agent Myron Selznick, brother of studio executive and producer David O. Selznick. He was later joined in the building by an assortment of advertising agencies, bank offices, investment firms, stock brokers and financial advisors. The building became a destination for actors and others working at the studios to visit their agents and check on their finances. 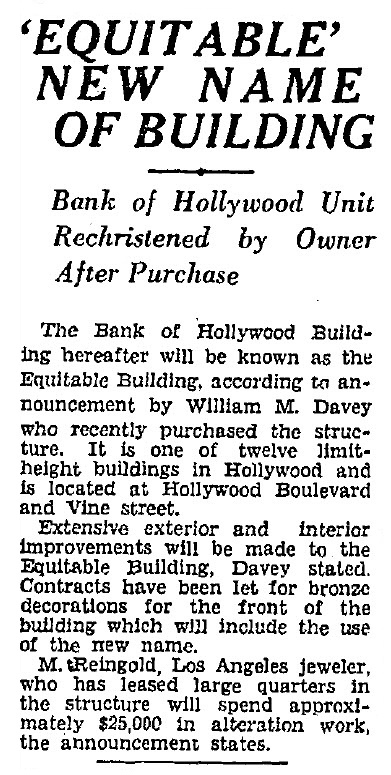 In December 1930, a month before the new hotel opened, the Bank of Hollywood was ordered closed by state banking regulators when it was found that the bank didn't have enough available cash to meet the claims of depositors. When reorganization plans failed, the bank was ordered to be liquidated. 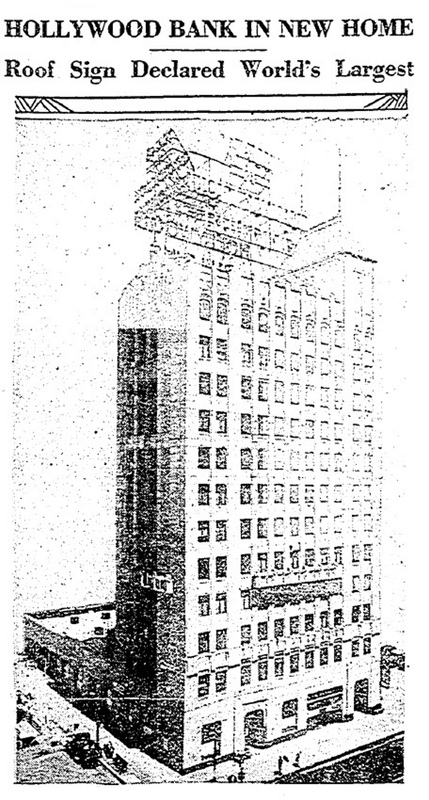 The Bank of Hollywood Building, including the new adjacent hotel, was sold in January 1931 for $1.5 million to developer and investor William M. Davey, who renamed the structure the Equitable Building. The Equitable Investment Corporation was located on the fifth floor of the building. On Monday, Feb. 17, 1936, at about 11:30 a.m., secretary Dorothy Weil was relieved at the Equitable Investment switchboard by Dorothy Hammarstrom, and she headed out of the office for lunch. As soon as Weil left the office, she recognized a familiar figure standing in the hallway -- her ex-husband, whom she had divorced 18 months earlier. "He has been to my home at 1616 North Normandie Avenue several times recently and threatened to kill me, so I went back," Weil said. "I went to the private office of J.S. Rex Cole, vice president of the firm, who is my employer, and told him I hated to bother him with personal affairs, but that I was afraid my ex-husband would shoot me." Cole told Heil to stay inside the office, and he called the police. Cole then went out into the hallway, and saw the man standing in a corner, with his hat pulled low in front of his face and his overcoat collar turned up. Cole walked past the man, pretending that he didn't see him, and continued to the elevator. Outside the building, Cole found Traffic Officer Earl G. Reed, a 23-year veteran of the LAPD. Cole knew Reed, who was popular in the area as the traffic officer working the Hollywood and Vine intersection. Cole told Reed about the situation on the fifth floor, and Reed wanted to go up immediately, but Cole told him the man might be armed, and convinced him that he should wait for additional officers to arrive. When Officers Clyde Pritchett and N.A. Pound arrived in their radio car, the four men went back into the building, and up to the fifth floor, where they encountered one of Cole's co-workers, stock broker Alvin Giles. While Giles and Officer Pound searched the hallway, Cole went with Officers Pritchett and Reed back to the Equitable Investment offices, where they found the man, still standing in the hallway. Cole asked the man if he was Weil's ex-husband, and the man said he wasn't. While the officers stayed with the man, Cole went into the office to get Weil, to see if she could identify him. The man was holding a gun in the pocket of his overcoat, and the officers were standing about two feet away from him. When Cole turned to walk back to the office, the man fired three times at Reed through his pocket. "I turned and hadn't taken two steps down the hall toward my own office when the firing started," Cole recalled. "I saw Reed stagger back toward the entrance door and grab for his gun, then fall." Pritchett ducked behind a corner in the hallway and pulled his gun. The gunman fired one shot at Pritchett, hitting him in the chest. As the officer fell, he was able to return fire, and hit the gunman in the abdomen. According to Cole, "Pritchett looked up at me and said, 'He got me, Cole, but I got him. Watch him and see that he doesn't shoot again.' It was all over in two seconds. Pritchett sank back to the floor." Pritchett died at the scene. He was 41 years old. Reed was hit three times -- in the right shoulder, right arm and left hand. He was able to stumble to the elevator and reach the lobby of the building, where he encountered Henry Menjou, the brother of actor Adolph Menjou. Menjou went to a nearby pharmacy and got a tourniquet for Reed to stop the loss of blood, then called for an ambulance. Reed and the gunman were both taken to Hollywood Receiving Hospital. Reed was later transferred to Georgia Street Receiving Hospital, where he recovered from his injuries. The gunman told investigators he planned to shoot his ex-wife, then kill himself. He was taken to the prison ward at General Hospital, where he died four days later. Clyde Pritchett was born on New Year's Eve 1894, in the small town of Bynum, Texas, about half-way between Dallas and Waco. Pritchett was one of 12 children born to John Frank Pritchett, a farmer, and his wife, Violet Henrietta Wainscott Pritchett, but only nine of their children survived childhood. In the mid-1910s, the Pritchetts and their three youngest children -- Clyde and his younger sisters, Sybil and Flora -- moved to Santa Ana, in Orange County, California, where John Pritchett purchased a farm. In 1917, Clyde Pritchett, 22, was drafted to serve in the U.S. Army during World War I, and was assigned to the 34th Balloon Company. During the war, tethered observation balloons were sent aloft for reconnaissance and to track enemy troop movements. Pritchett and his company trained at Camp John Wise in San Antonio, Texas, for several weeks before they received their orders for overseas duty. The balloon company traveled to Virginia, where they departed from Newport News on Oct. 21, 1918, aboard a U.S. Army transport ship, arriving in France on Nov. 3. On Nov. 9, the company hiked to their camp near Vannes, France, and set up their equipment. Two days later, on Nov. 11, the armistice was signed ending the war, and Pritchett returned home to Santa Ana. After the war, Prichett worked as a cutter in a meat market before he joined the LAPD on Oct. 23, 1923, starting first as a chauffeur before he was promoted to patrol officer six years later. 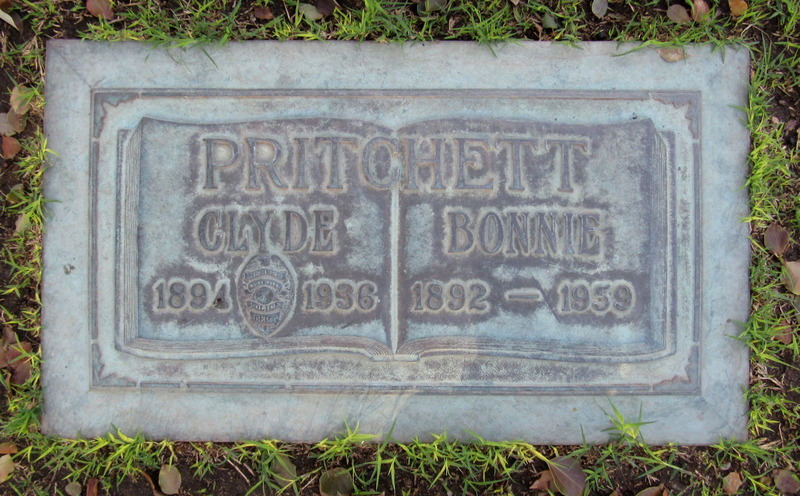 At about the time he joined the LAPD, Pritchett married Annie Laurie "Bonnie" Wilber, who was born in Minnesota but moved to Southern California with her family when she was a teenager. Their daughter, Virginia Mae Pritchett, was born on July 13, 1925, followed by their son, William Clyde Pritchett, on May 27, 1930. When Pritchett was killed, his daughter was 10 years old, and his son was 5. Pritchett was buried at Grand View Memorial Park, in Glendale, Calif. Twenty-three years after his death, in 1959, his widow joined him there, at the age of 66. Their son, William, died in 1980, at the age of 49, and their daughter, Virginia, died in 2004, at the age of 79. 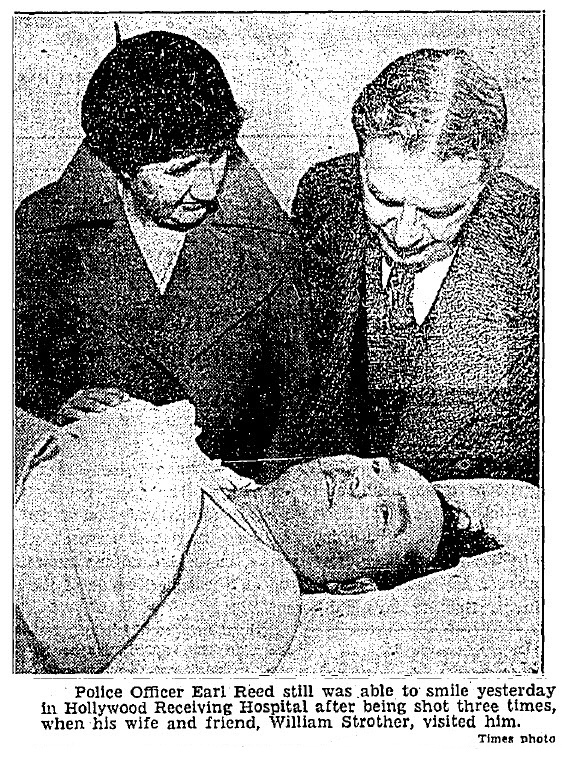 Reed, who was 47 at the time of the shooting, recovered from his injuries, but suffered nerve damage in his right arm, and took a disability retirement from the LAPD. 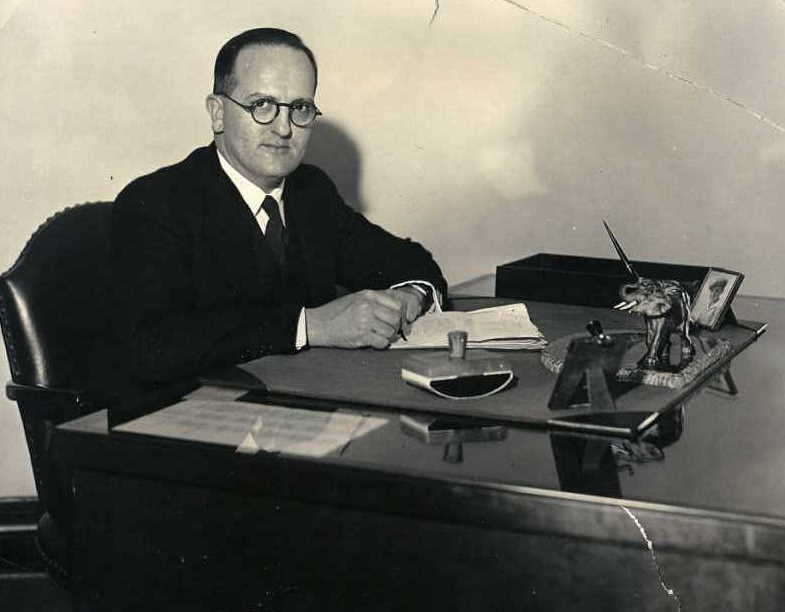 He died in 1954, at the age of 65. The Equitable Building still stands at the corner of Hollywood and Vine. The building was sold in 2000 and, after a $50 million renovation and restoration, was re-opened with retail businesses on the ground floor, and the upper floors converted to loft apartments and condominiums. Officer Pritchett's sign is located on the south side of Hollywood Boulevard, between Vine and Argyle, across the street from the building where he was killed. 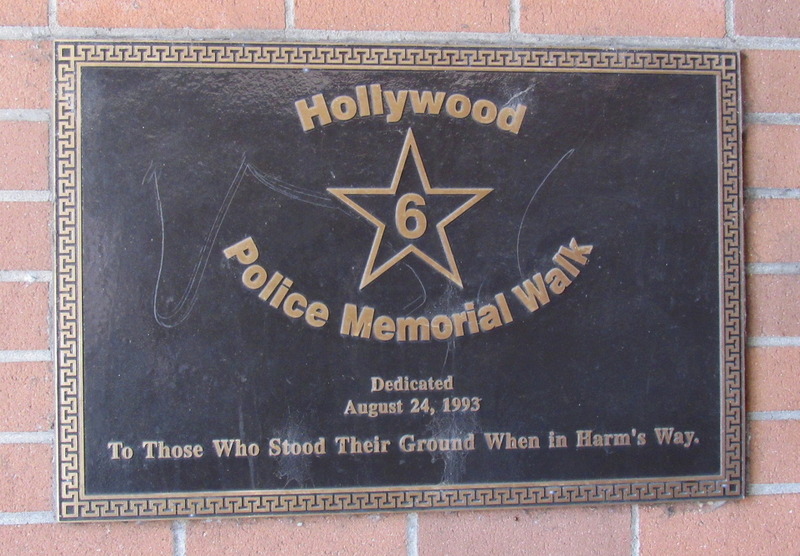 He is also honored with a star on the Hollywood Police Memorial Walk outside the LAPD's Hollywood Station, 1358 Wilcox Ave., along with seven other officers from the station who died in the line of duty. The stars are designed to look like the stars of celebrities on the Walk of Fame on Hollywood Boulevard and Vine Street. Pritchett's name also appears on a special LAPD Hollywood star just off the Hollywood Walk of Fame, at the southeast corner of Hollywood Boulevard and La Brea Avenue, near the silver "Hollywood Gateway" statue. The star includes the names of the eight officers from the LAPD's Hollywood Division who have died in the line of duty. 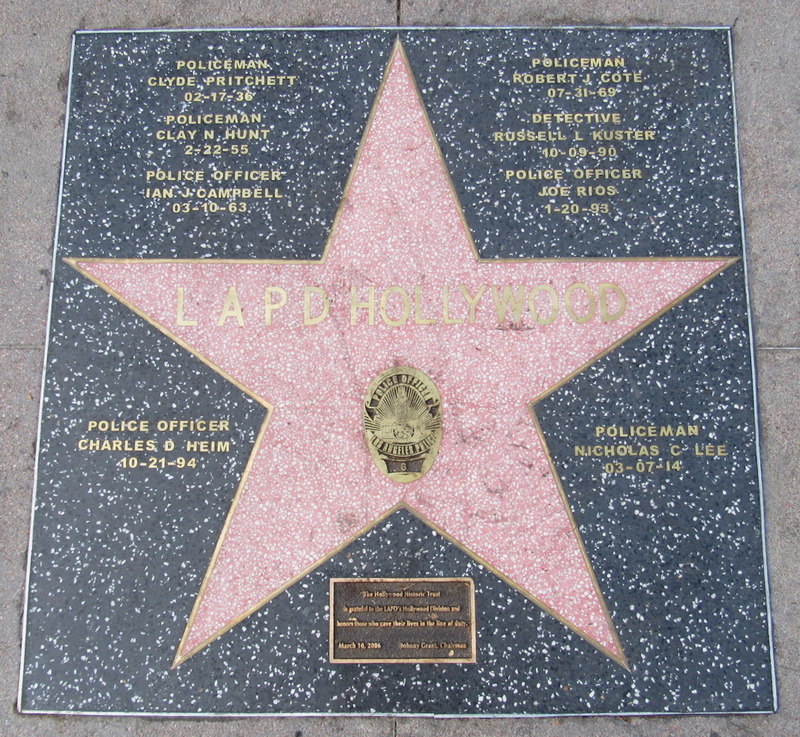 The LAPD Hollywood star was originally installed in 2006. The star was refurbished and re-dedicated in October 2017.